Here’s a project I’m truly proud to have my name attached to: The Neighbors Project. And the nifty new “Bodega Party in a Box” from the non-profit organization’s Food & Liquor store initiative, which aims to put more fresh produce on the shelves of corner stores (aka bodegas). 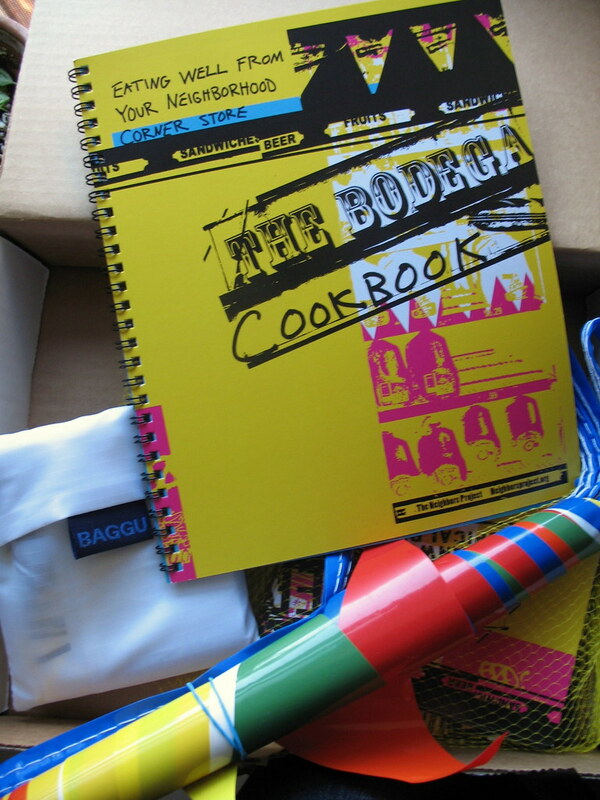 Inside the box, there’s a cookbook filled with bodega-friendly recipes, tips and fun anecdotes from contributors (including the lovely Daisy Martinez, and yours truly) about their favorite bodegas, a silk-screened Baggu reusable shopping bag, a stack of party invitation cards and envelopes, and some flags to deck your pad with. What’s this all about? I had the chance to sit down with Kit Hodge, co-founder and CEO of The Neighbors Project, for coffee in my old neighborhood of Fort Greene, Brooklyn, where she’s visiting from San Francisco. This Bodega Party is a really fun idea. Have you guys hosted a bonafide one yet? KH: Not yet. 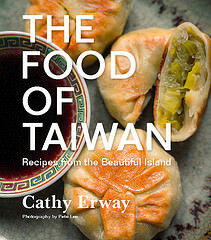 We held a cooking class in April, but for the official launch of this project, coming up in a few weeks, we’re planning to have one. KH: Exactly, that’s what we’re hoping. How did you fund the project? KH: Our organization is 99% volunteer-based, so everything we’ve done has been subsidized by various donors. So all the things like the paper and printing were donated for the cause, and the artists behind the design, etc… each box that’s sold goes into the funding of the project and into future initiatives from The Neighbors Project. Okay, so why shop in bodegas, as opposed to other grocery stores or bigger ones? KH: If you care about your neighborhood, and the people in it, it’s good to shop in your neighborhood. People tend to feel close to their bodega, have a special tie to it. By going there to shop and helping raise demand for fresh foods, you also help out everyone else in your neighborhood. We began the Food & Liquor project [in 2006 — Ed.] in Chicago’s Upton neighborhood, which has a very interesting community. It’s very diverse, and it’s a recently gentrified neighborhood. KH: Exactly. By talking to a lot of store owners we found that many of them tried to stock more fresh foods, but not enough people bought it. So it’s an altruistic angle, to some extent. We found that a lot of newcomers were going outside of their neighborhood to shop. It’s also good to have a strong corner store culture — who doesn’t like to go somewhere and have people know your name? It’s a good feeling. Yeah, why do so many people shop outside of their neighborhoods? KH: I think there’s a huge psychological barrier for some folks, especially if they grew up in the suburbs. They might be used to the cookie-cutter atmospheres of WholeFoods or other big chains, and identify corner stores as not a place for them, or see them as dangerous, or drug-related, and while there might problems there to an extent, they should see them as a place for them. You mentioned the phrase “corner store culture” — what do you think that means? KH: Yeah, or swaps random favors like that with them. So, is getting bodegas to stock more fresh produce the project’s main concern, for obvious nutrition reasons? Or are there any other goals for bodegas you’d like to see? KH: I think that would help change the culture of the store — I don’t know if you saw this famous YouTube video about the bodega in Bronx, making fun how horrible and awful most of the stuff there was. But introducing fresh, quality foods changes the environment; it can make it seem like a more inviting, more safe place, and I keep looking at that one across the street from us, but things like, see how the window facade is covered up with all those stickers and signs? Making it more transparent, and all those little things to also make it seem less dangerous so more people will shop there. But not to take away its character completely… Back in Chicago, where I grew up, there was this one little store I used to go to all the time, and I’d go up the counter and count all my pennies and buy something small, and they had one video game that my brother used to play — and I realized the store owners were sort of looking out for us, and it was a friendly, safe place to gather. On the website you have a step-by-step How-To Guide on demanding fresh produce in your local corner store. Do you have any success stories about this? KH: You know, it’s a really big issue that a ton of organizations around the country have been working on. There’s a whole organization working on it even called the Healthy Corner Store campaign — so I can’t really give you any specific success rate, but it’s very much a work-in-progress. It’s difficult, because a lot of the people who’ve demanded changes are lower-income people and they have to work a lot of the time, so a lot of the campaign is about lowering the burden on them, broadening the range of voices, and making it more evident. It’s a market demand issue, really. Because we don’t want to burn the business owners, and they have such small profit margins to begin with — it’s not like a lot of these people have MBAs or sophisticated models for implementing change and profit growth to work with, so it’s complicated. It’s not a moral crusade, that’s for sure. Why do you say that, it’s not a “moral crusade”? KH: Well, a lot of people might say, let’s do it! Let’s affect this change, but in reality it has to work out for them financially. So it’s not just about them seeing the light or wanting to stock healthier food, they have to think of it as a smart business move, too. So, let’s throw more bodega parties, for instance? KH: Right. All the projects we do are not just to have a local impact, but so that people can replicate it throughout the country. Finally, how did you find the contributors for the cookbook in the box? KH: I just did a lot of searches for food bloggers and tried typing in the word “bodega” and that’s how I found you! Because you did that Bodega Challenge hosted by the Brooklyn Kitchen. And who can forget that? To get into the bodega party spirit and help out with all these great causes, you can order a Bodega Party in a Box now through The Neighbors Project website. And keep eating healthily, locally, and with a social conscience — in your neighborhood. Interesting concept. My favorite place to shop (in Chicago) isn’t really a bodega, but a small Italian grocery store called Bari Foods. It’s practically the size of a large bodega, but has has a great meat section in the back. I found that my bodega in Seattle often had cheaper prices than the huge QFC grocery store in the area, and I would have shopped there much more often, if like you suggest, they carried more fresh produce. Oh I’m so glad you did this profile. I pre-ordered my box and am so super-excited to get it! This is a huge issue here in San Francisco and I’m so glad women like Kit are on the move and making change. Again, I apologize for having to leave a comment, pl. note it is not my intent to spam you. what a cool idea & project! i hadn’t ever even thought to go to bodegas for fresh fruits & veggies– but this all makes a lot of sense. Oh well, my colleagues have introduced an women’s handbags discount online store. They said that price and quality are very good. Can you give me more suggestions? Hi, respectable article, you staked all the same if you don’t mind I’d bring few points out about approaches young women or guys. Peculiarly it can be powerful when it gets to man woman relationships. The main thing is your attitude, which should be fresh and active. If you have an position like that, any soul shouldn’t mark any difficulties that you have addressing as showing. When you start a conversation, you commonly require to ask safe wonders that are trusted not to cause her any soreness. Once the conversation takes some momentum, you can exact more personal queries. A good illusion is to memorise some questions she made a point of so whenever the conversation slows down, you can mention one of these questions. Hi good post. I consider these leads might be reusable overly. Now the pleasant pick up lines are the ones that lighter the woman. Straightaway several of the lines might just be in all respectable fun to help break the ice. That is rattling and it can at last lead to fetching up in sleep together with her at the end of the night. Heck what man doesn’t want that, but familiar what to articulate and how to pull it off can take on a bit of exercise. A serious pick up draw will take you in the door but from there you have to be capable decent to hold the conversation getting. Hiya!. Thanks for the info. I’ve been digging around looking some info up for shool, but there is so much out there. Yahoo lead me here – good for you i suppose! Keep up the great information. I will be popping back over in a few days to see if there is any more info. Just a quick note to say thanks. I’ve been scanning your blog for a few days now, and have gotten quite a bit of good information as well as liked the way you’ve structured your site. Quality information is priceless! This was interesting. You seem very knowledgeable in your field. Thanks for your great post! It has been extremely insightful. I wish that you will continue sharing your wisdom with us.